Goodreads Summary: For as long as Esmerine can remember, she has longed to join her older sister, Dosinia, as a siren--the highest calling a mermaid can have. When Dosinia runs away to the mainland, Esmerine is sent to retrieve her. Using magic to transform her tail into legs, she makes her way unsteadily to the capital city. There she comes upon a friend she hasn't seen since childhood--a dashing young man named Alandare, who belongs to a winged race of people. As Esmerine and Alandare band together to search for Dosinia, they rekindle a friendship . . . and ignite the emotions for a love so great, it cannot be bound by sea, land, or air. First of all, how beautiful is this cover? I would have read this book without knowing anything about it based on the cover alone. But then you open the cover, and the story is beautiful as well. 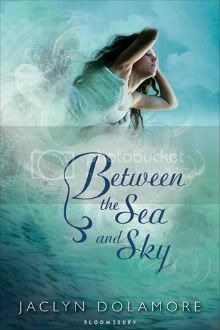 In Between Sea and Sky, Jaclyn Dolamore blends the lore of flying creatures and mermaids with siren mythology, creating a fairy tale that is all her own. Although a mermaid, Esmerine has always been fascinated with the surface world. She longed to become a siren, just like her older sister Dosia, and together they would explore the mainland and have adventures. After years of training, Esmerine is finally initiated as a siren. But on her first day in her new calling, her sister isn't there. Instead, Dosia has run away to the mainland - or maybe even been kidnapped and taken there. Esmerine's family searches for news, but they cannot learn anything for certain. Esmerine knows that she will have to go to the mainland and search for her sister herself. She transforms her tail into legs, enduring the pain each step causes her and making her way into the city. There she finds an old childhood friend, Alander, a winged creature who can help her search for her sister. But their search takes them far from the land that Esmerine has known, and it soon becomes a search for true self...and a quest for love. Between the Sea and Sky transports you into another world, one full of magic and enchantment. I really enjoyed the descriptions of Esmerine's life under the sea, the theatricals and dances of the merfolk and their time scavenging in sunken ships. Yet even more than other sirens, Esmerine is drawn to the surface world. She learned to read and write, and her passion for stories and fairy tales was one of the things I liked most about her. In addition to this, her loyalty and kindness make her a character that you want to see succeed in finding her happily ever after. When Esmerine ventures onto land, the story still maintains its "once upon a time, in a faraway land" feeling, which I appreciated. I also enjoyed watching Esmerine come to truly understand herself and come to realize that not one thing is right for everyone. However, I have to say that I did have some problems with the relationship between Esmerine and Alan. While at times it was very sweet, I would have liked to have seen it developed more. Even though I understood the reasoning behind it, I felt that they were both so distant from each other most of the time. In addition, a few scenes felt rushed or left me wanting more description. That being said, the descriptions that are given really make the story come alive; the reader lives along with Esmerine and Alan rather than simply following them. If you are a fan of fairy tales, be prepared to enchanted by this book. I will look forward to seeing what Dolamore writes next!